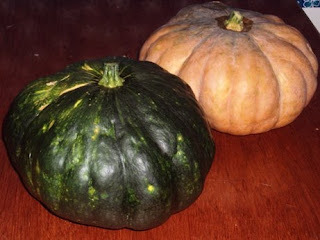 Matt's Samoa Blog: Pumpkins? Pumpkins! Volunteers’ green thumbs became noticeable shortly after we moved into our places. Phil did some upkeep on the garden Dylan cultivated, and then made some of his own additions. Paul got a nice garden going and has spent much of the Swine Flu break working on it. 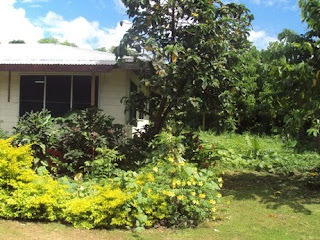 The people who lived in my house before me were gardeners of sorts, but I admit, it doesn’t interest me all that much. I’ve stayed away, but lately I’ve been unable to ignore the pumpkins. I still haven’t bought a machete, so I have no means of holding back the foliage, and the pumpkin plant has taken advantage of this situation. Pumpkins are a sprawling plant to begin with, and when the tropical heat and rainfall combine with my lack of maintenance, it makes for a one plant pumpkin patch in my front yard. It’s the kind of deal where you can stand at the end of one arm and look 20 yards yonder and see the same plant all leafy in the distance. It’s blossomed and begun to grow fruit, one sizable pumpkin growing right along the walkway to my front door. I was told on two separate occasions by two different Indian missionaries that it was near-ripe and that I should pick it soon. So on Tuesday I went outside with my Alaskan pocket knife and cut the thing. Then I went around the side of the house and found another, so I cut that one too. I shrugged. “Sure.” Fine by me. What am I going to do with a pumpkin patch? I have a plethora of pumpkin. How hard can it be to make pumpkin jam? 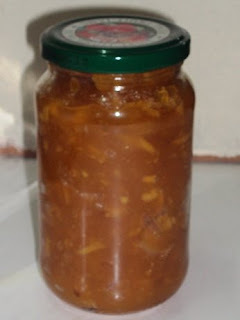 I Googled and found a recipe for pumpkin/ginger jam, which sounded intriguing. Done and done. It was already late on Tuesday, so I figured I’d make the jam on Wednesday, but in the mean time I would have pumpkin and taro for dinner. I started to boil water to cook the taro when my stove ran out of natural gas. Sure. I finally start to prepare something besides peanut butter and jelly for dinner and the stove goes out. Getting gas was a bit of an ordeal. The Congregationalist church has a well-oiled system in place for covering our electric bills, but the natural gas thing throws a wrench in that system. There were taxis called and strings pulled and it took half a day, but I was able to finagle a surprisingly fast reimbursement. Koa came over to hang out, not knowing about the jam-making plans. He grated ginger while I chopped up the pumpkin. Though I’d read the recipe at least 10 times, I still managed to add the sugar far too early. Blakey showed up, and it turns out she used to make jam with her grandmother, so she had a little more experience in terms of jarring. 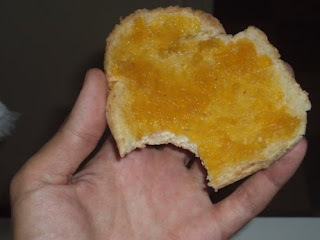 In any case, the sugar turned out to be a non-issue, and the jam isn’t half bad. The ginger is very strong (to the point it has a small spicy kick), and the pumpkin can be difficult to discern, but for mucking up the sugar and it being our first time and all, I’m calling it a success. The pumpkin reduced quite a bit, so we only made a jar and a half of jam. That said, there was still plenty of pumpkin left. 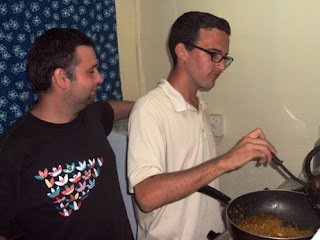 We had Pumpkin Dahl that night, and last night I had stir-fry pumpkin. And there’s still a large plastic bag of pumpkin chards in my refrigerator. Chris recommends I break out the mamoe. Maybe I will. I hope you’re DIY-ing too. Pictures below. The lawnmower man came through earlier this week, so it's difficult to see where the pumpkin patch is now, but you can see some big pumpkin leaves in front of my house, and then if you look way back to the right, there are lots and lots and lots of pumpkin leaves. Oh, I forgot! Part of the ordeal of getting new gas was disconnecting the stove from the tank. 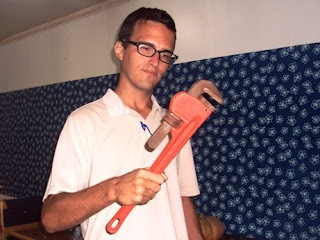 It necessitates a wrench, but the only wrench our school custodian could find was this heavy duty monkey wrench. I found this hilarious. It ended up being too big to fit around the small bolt. (Note: It is nearly impossible to write about a monkey wrench without getting the Foo Fighters's "Monkey Wrench" in your head. With editing the picture and typing this caption, I've listened to it 3 times already.). 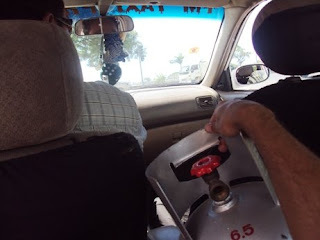 Riding in the back of the taxi, gas tank in tow. Later at the natural gas refill station, I saw a sign saying it was law that tanks can only be carried in the trunk. Oops. The finished product. The coolest part is that the "freshness seal" pop-top stays down when the jelly cools. It spreads well. Not half bad. That isn't a monkey wrench, it's a pipe wrench. You can add making pumpkin jam to the Thankgiving eve tradition. I'm sure Martha woundn't mind. pumpkin pie or tarts are also extraordinarily delicious! after you cook the pumpkin, you can freeze it for later...is that an option at your place? ?